scam, scare tactic, myth, hype, and hysteria. Trump Climate Panel Could Expose Huge Fraud, Hence the Hysteria. The collective freak out over President Donald Trump's proposed Presidential Committee on Climate Science (PCCS) highlights the fact that the hysteria surrounding the man-made global-warming hypothesis is unscientific — and that it must be re-examined by competent, credible experts. According to scientists and experts, if the science on "climate change" were truly settled, Democrats, tax-funded climate alarmists, and the establishment media would all be celebrating another committee to confirm that "conclusion." Instead, the unhinged shrieking over Trump's plan to investigate the matter strongly suggests something very fishy is going on, critics argued. Indeed, there is a good chance that even more fraud could be revealed. Ten Years after Climategate, the Global Warming Fraud Is on Life Support. The global warming hysteria was reaching a crescendo in the lead up to the climate confab in Copenhagen in 2009 when a civic-minded person released the Climategate emails, deflating the whole thing. Those emails, concocted from the fevered imaginations of the scientists involved. Nigh on 10 years have passed since then and we are currently experiencing another peak in the hysteria that seems to be coordinated worldwide. But why? Why now? The global warming scientists have plenty of time on their hands and plenty of money. Idle curiosity would have got some to have a stab at figuring out what is going to happen to climate. Do they see an imminent cooling and they have to get legislation in place before that is apparent? The End of the Climate Hoax is Coming. The "elite" that are in positions of power in our country have decided to make a final push on climate change before being debunked in the future. The man-hater from Hawaii Mazie Hirono stated in the past week that the Green New Deal is recognition that climate change is happening and that we should not stick our heads in the sand. She has described President Trump, and his minions know zero about the subject and that they deny the "science" behind climate change. Since the subject has gone from global cooling to global warming, to climate change, it proves that those who are pushing the globalist agenda are the ones who profit from instilling fear in the world population. The Hoax of 'Climate Change'. Obama knows. John Kerry knows. And Al Gore, the man who has made an enormous amount of money perpetuating the biggest hoax foisted on the human race, knows. Human-inspired "climate change" is a ruse. It is all a control-grabbing, land-grabbing, money-grabbing hoax. [...] The real inconvenient truth is that the earth's climate has been warming, cooling and dramatically changing since the beginning of time. How many of us know that Chinese sea captains reported melting ice caps as far back as 1434? Mega earthquakes and tsunamis as well as blizzards, raging fires, crippling droughts, powerful storms, horrific tornadoes and scorching heat waves have been around since antiquity. "Climate deniers," as the alarmists so lovingly refer to us, do acknowledge changes in the climate, but most of us do not accept the premise that human activity the cause. Climate Hoax: Global CO2 Emissions Spike, Despite Paris Climate Pledges. Three years after leaders from around the world signed on to the Paris climate agreement, pledging to cut their carbon footprints, global CO2 emissions accelerated. Does anyone still think President Donald Trump was wrong for pulling the U.S. out of this sham agreement? Climate Hoax: Not A Single G-20 Country Is Close To Hitting CO2 Emission Targets. A new report calls the lie on the grand Paris climate change treaty. None of the promised cuts in CO2 emissions that 200-plus countries made will come close to preventing a climate "catastrophe." And many of the industrialized nations aren't even living up to the promises they did make. [...] As the Climate Transparency report notes, the EU "is not on track to meet its 2030 target." Nor is Mexico, Australia, Brazil, Canada, Japan or Turkey. A number of G-20 countries actually saw their emissions increase in 2017, including Australia, Brazil, Canada, China, France, Germany, India, Indonesia, Japan, Russia, Saudi Arabia, South Korea and Turkey. Is Renewable Energy a Fraud? Can it be that wind and solar energy is a complete fraud? In the book "Dumb Energy," Norman Rogers makes a powerful and convincing case. His main point is that there must be backup generating plants because the delivery of electricity from wind or solar is erratic, depending on the surging or weakening of wind and sunlight. The backup plants supply kilowatt hours when the flow of green electricity falters. [...] If you have to have a backup plant, why not eliminate the wind or solar and just use the backup plant? How Al Gore Built The Global Warming Fraud. Although his science is often seriously wrong, no one can deny that Al Gore has a flair for the dramatic. Speaking about climate change in an October 12 PBS interview, the former vice-president proclaimed, "We have a global emergency." Referring to the most recent UN climate report, Gore claimed it showed that current global warming "could actually extend to an existential threat to human civilization on this planet as we know it." Al Gore's overblown rhetoric makes no sense, of course. Yet his hyperbolic claims beg the question: How did this all start? Global warming is measured in tenths of a degree, so every artificial upward nudge creates a deceptive picture of actual temperatures. To avoid artificially elevated readings, NOAA's own official site location standards require that thermometers be placed at least 100 feet from any paved or concrete surface, and in a level, open area with natural ground cover. Those standards were clearly subverted, and every voter should demand to know why. The UN Admits That The Paris Climate Deal Was A Fraud. According to the latest annual UN report on the "emissions gap," the Paris agreement will provide only a third of the cuts in greenhouse gas that environmentalists claim is needed to prevent catastrophic warming. If every country involved in those accords abides by their pledges between now and 2030 — which is a dubious proposition — temperatures will still rise by 3 degrees C by 2100. The goal of the Paris agreement was to keep the global temperature increase to under 2 degrees. Global Warming: The Evolution of a Hoax. [Scroll down] The only real proof of the scientific theory was computer models, programmed to assume that increasing carbon dioxide was the most important factor driving climate. One of those who objected to the "predetermined" conclusions of such models was Dr. Richard Lindzen, the Alfred P. Sloan professor of meteorology at the Massachusetts Institute of Technology. His 1992 paper pointed out that the models ignored other important factors that would have had cooling effects — namely, water vapor, cloud cover, and oceans. Lindzen also noted that global temperatures had risen in the 1920s and 1930s, when carbon dioxide emissions were comparatively low, but fell back between 1940 and the 1970s, when emissions were rising much more steeply. Guess Where The Money Behind Al Gore's Promotion Of Climate Hysterics Came From. If you think former Vice-President Al Gore, and current head of the Church of Climate Change was helping to save the world out of the goodness of his heart with his own money, you are sadly mistaken. As leaked documents reveal, Gore was having his pockets filled by an outside source that had a specific interest in the climate hysterics being spread far and wide. And that source was none other than leftist sugar daddy George Soros. According to Daily Caller, documents published by DC Leaks show that Soros's group Open Society Institute (OSI) threw $10 million at Al Gore in 2008 to push climate panic in order to help push policies surrounding the bad science. Liberals paid dearly last week for global warming hysteria. Usually when liberals are wrong about something, they pay no penalty for their error. For example, their false claim that Trump's election led to more hate crimes went unpunished because by the time the truth arrived, liberals had changed subjects to a whole new set of lies: Russian dossier. For decades, liberals got away with global warming lies — even changing the name to climate change in an effort to obscure the falseness of their prophesies. Unambiguous Fraud In The National Climate Assessment. The National Climate Assessment claims unambiguous warming globally and in the US since 1880. 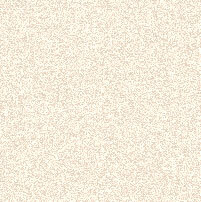 [... But] They have no idea what global temperatures were in 1880, 1900, 1920, 1940, or in fact the present, because outside of the US there is very little verifiable data. Washington Post inadvertently unmasks climate change scam. Wait a second. If carbon dioxide really were a threat to the planet, other countries would dig deeper in their pockets to pay for this. [...] So basically this is another foreign aid scam, which usually becomes a welfare program for dictators. Man-Made Climate Catastrophe Is a Myth, More Studies Confirm. From the world of science — as opposed to grant-troughing junk science — two more studies confirming that the man-made global warming scare is a myth. One, a study by Scafetta et al, published in International Journal of Heat and Technology, confirms that the "Pause" in global warming is real — and that "climate change" is much more likely the result of natural, cyclical fluctuations than man-made CO2 emissions. The Great Climate Hoax Challenged by 31,000 Scientists. For the Democrat Party, the issue of Climate Change is among their top issues, and everything environmental rotates around the belief that the global temperature is being altered by human activity, largely in relation to "fossil fuels." However, if we look back into history, what we see is a planet that is constantly changing, in terms of global temperature. Global warming and planet-wide ice ages dot our history as a planet long before the rise of industry, or the use of "fossil fuels" — a clue that the rise and fall of global temperatures are a natural phenomenon. The influence of human activity is very small on the wider picture, and at most negligible in its influence on global temperatures. Is the Earth's Climate History Largely a Fraud? Liberals want us to turn control of our economy over to them, not because their stewardship has been successful in the past — heh — but because if we don't, the Earth faces imminent climate catastrophe in the form of global warming. Some (e.g., liberal reporters) accept such claims uncritically, while the rest of us want to see evidence. In this debate, there are two types of evidence. The first is the raw material of science, observation. 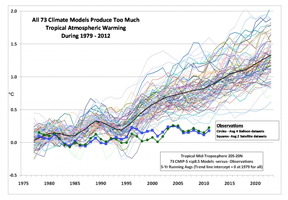 The second is climate models created by alarmists for the purpose of generating scary scenarios. Anyone with the slightest acquaintance with science understands that observation (type 1) trumps theory (type 2). Which is a serious problem for the left-wing warmists, since temperature records show that their models are wrong. How have liberals chosen to deal with this conundrum? By admitting that their theory, as embodied in their models, was wrong? Don't be silly. They control pretty much all of the Earth's historic temperature records, so they have changed them to make their theory look more credible — although, even with their adjustments and "corrections," it still fails. Renowned climate scientist jailed for fraud. [Dr. Daniel] Alongi is not some minor figure in the Warmist research establishment. Why was health agency pushing the climate change lie? I will flat out call it a lie. For 30 years now, the United Nations and other Marxists have pushed the unhinged theory that man is causing the world to burn out of control. That is what global warming (now called climate change) is all about. Is Global Warming Alarmism a Complete Fraud? I usually try to give global warming hysterics the benefit of the doubt — sincere but misguided, not good at math, unacquainted with the Earth's highly variable climatic history, and so on. But sometimes data come along that make that sympathetic attitude hard to sustain. [...] There is no other branch of science in which such after-the-fact changes in data to fit a politicized theory would be greeted with anything but contempt. Why are such shenanigans tolerated here? Presumably many billions of dollars in government funding have something to do with it. These charts are interesting, too. Reading the newspapers, you would think that we are suffering through an unprecedented heat wave every year. But that isn't true at all. Dr. Tim Ball Crushes Climate Change: The Biggest Deception In History. [Scroll down] It is impossible to identify the human cause without understanding and including natural causes. Few know that CO2 is only 4 percent of the total greenhouse gases. They assume that a CO2 increase causes a temperature increase. It doesn't, in every record the temperature increases before CO2. The only place where a CO2 increase causes a temperature increase is in the computer models of the IPCC. This partly explains why every single temperature forecast (they call them projections) the IPCC made since 1990 was wrong. If your forecast is wrong, your science is wrong. It's the theory of Global Warming that's really dangerous. Even if one does not have a scientific background, one can reasonably question why someone like Al Gore who is not a scientist can become a billionaire selling carbon credits. This snake oil venture allowed environmental activists to continue their wasteful abuse of resources by buying a carbon credit permitting them to emit a certain amount of greenhouse gas. The funds would then be paid to projects that absorb these gases like planting trees, etc. This is, of course, an oversimplification but actually reading the details of this scam is mind boggling. 'Global Warming' Is a Myth, Say 58 Scientific Papers in 2017. By "global warming" these papers don't, of course, mean the mild warming of around 0.8 degrees Celsius that the planet has experienced since the middle of the 19th century as the world crawled out of the Little Ice Age. Pretty much everyone, alarmists and skeptics alike, is agreed on that. Rather, they mean "global warming" in the sense that is most commonly used today by grant-troughing scientists, and huxter politicians, and scaremongering green activists, and brainwashed mainstream media (MSM) environmental correspondents. "Global warming" as in the scary, historically unprecedented, primarily man-made phenomenon which we must address urgently before the icecaps melt and the Pacific islands disappear beneath the waves and all the baby polar bears drown. The Paris Climate Deal Was A 'Fraud' And A 'Sham' ... Until Trump Decided To Ditch It. Shouldn't environmentalists be celebrating the fact that President Trump decided to withdraw from the Paris climate-change agreement? After all, when it was signed, many of them called it a fraud, or worse. Al Gore Furious! With Ice Growing at Both Poles, Global Warming Hoaxes Implode! In Antarctica, sea-ice levels just smashed through the previous record highs. There is now more ice than at any point since records began. In the Arctic, where global warming hoaxers prefer to keep the public focused since the Antarctic ice has been growing, scientists said sea-ice melt in 2014 fell below the long-term mean. Is Global Warming A Myth? For a long time, I have been skeptical of the catastrophic anthropogenic global warming theory, which I think is utterly refuted by the evidence. But I have been willing to assume that in recent decades, the Earth has in fact gotten slightly warmer, consistent with the natural fluctuations that have been going on for millions of years. At Watts Up With That, Dr. Fred Singer suggests that this assumption may be unfounded. The balance of evidence, he argues, shows that the Earth has not warmed perceptibly during the time when alarmists claim to see the effects of CO2 emissions. Is Global Warming Science Just A Fraud? We're often told by advocates of climate change that the "science is settled." But in fact, "science" itself is in a deep crisis over making claims it can't back up, especially about climate. [...] Being able to reproduce others' experiments or findings from models is at the very heart of science. Yet, radical climate change advocates would have us spend 2% of global GDP, or roughly $1.5 trillion a year, to forestall a minuscule amount of anticipated warming based on dubious modeling and experiments. Meanwhile, the federal government spends literally billions of dollars a year on climate change, with virtually none of the money funding scientists who doubt the climate change threat. There is no serious debate. This is a problem for all of science. Democrats' Real Global Warming Fraud Revealed. The Democrats are devastated by their recent lost elections. They will be even more devastated as we learn the details of their massive global warming fraud. Dr. John Bates, a former high level NOAA scientist, set off a furor by revealing that a recent NOAA paper, which claimed global warming hadn't "paused" during the past 20 years, was fraudulent. The paper was timed to undergird Obama's signing of the hugely expensive Paris climate agreement. This is only a tiny fraction of the climate fraud. Global Warming Hoax: Chicago Breaks Early Snowfall Record. Here's how the global warming hoax works: Liberals convince you that the world is heating up, they hit you with sad photos of polar bears, and you end up voting for a globalist agenda. That's been the plan since day one. Sure, you can throw in the occasional get-rich-quick scheme, a la Al Gore, but for the most part the idea is to install a global government or regime based on the idea that the world is getting too hot too fast and that the only way to combat it is to ditch our sovereignty. Unfortunately for that sill narrative, we have facts. Take Chicago in 2016, for instance. Original Environmentalist Denounces Global Warming Hoax. Slowly but surely the world's foremost scientific minds are discovering that their previously held beliefs on global warming are complete and utter trash. The latest convert to the church of actual scientific reasoning is James Lovelock, one of the world's premiere environmentalists, and in many ways the grandfather of the entire climate change theory. Lovelock, who is now 97 years old, has taken to the press to explain the reasoning behind his awakening. University Stole Millions from Taxpayers by Faking Climate Change Research. A global warming research center at the London School of Economics got millions of dollars from UK taxpayers by taking credit for research it didn't perform, an investigation by The Daily Mail revealed. The UK government gave $11 million dollars to the Centre for Climate Change Economics and Policy (CCCEP) in exchange for research that the organization reportedly never actually did. Many papers CCCEP claimed to have published to get government money weren't about global warming, were written before the organization was even founded, or were written by researchers unaffiliated with CCCEP. US Election Calls Out Global Warming Hoax. Donald Trump's election as U.S. president triggered fears that his view that global warming is a hoax might lead other nations to scale back ambitions under a landmark climate change deal, while renewable energy stocks fell on world markets. Carbon credit climate scam: the fraud prosecutions begin. The London Evening Standard has a very interesting story today (20 September 2016) describing the first day of a professor's fraud trial at Southwark Crown Court, London, for operating an alleged £60 million climate-related tax dodge. The story, headed World-famous conservationist "was part of £60 million eco-projects tax scam", says prosecutors allege that Professor Ian Swingland, a "renowned conservationist" who collected an Order of the British Empire from the Queen in 2007, together with four accomplices, had helped investors avoid tax on £170 million of income during a three-year "scam". Climate Alarmism: Probably the Greatest Hoax in History. Climate alarmism is nothing more than an attempt to scare people with unrealistic hypothetical climate outcomes based on computer models with no predictive power. The far left is trying to use this alleged threat to justify Federal Government intervention in the fuel and energy markets. Others, such as mainstream media, use it to sell their products. The current proposition offered by climate alarmists is that if people who live in the more wealthy countries cut back their use of fossil fuels and therefore their human-caused CO2 emissions that the world can avoid the alleged catastrophic increases in temperatures based on the climate models. Even the proponents' climate models do not show that the alleged effects could be avoided even if all the developed countries should somehow made substantial cuts in CO2 emissions. House Probe Reveals Audit Detailing Climate Change Researcher's 'Double Dipping' With Taxpayer Funds. Congressional investigators have obtained an internal audit from George Mason University that suggests one of its professors — a major proponent of man-made climate change — mismanaged millions of dollars in taxpayer money by "double dipping" in violation of university policy. The professor, Jagadish Shukla, received $511,410 in combined compensation from George Mason University and his own taxpayer-funded climate change research center in 2014 alone, without receiving required permission from university officials, the audit found. Profiteers of Climate Doom. The alarmists' predictions of global warming resulting from increased CO2 in the atmosphere have failed to come true. In scientific terms, that is the end of the story. A theory that is refuted by observation is wrong. But since billions of dollars in government money are flowing into the alarmists' coffers, they endlessly try to make excuses for their theory's failure, even as they cover up that failure by retroactively altering temperature records. This is the greatest scandal in the history of science, in my opinion. Five Ways We Know Al Gore's Been Running a Global Warming Racket. While preening at the Sundance Film Festival in January 2006 during the premiere of his "An Inconvenient Truth" fib-umentary, Gore made his grand declaration. The former vice president said, in the words of the AP reporter taking down his story, that "unless drastic measures to reduce greenhouse gases are taken within the next 10 years, the world will reach a point of no return." In Gore's own words, he claimed we were in "a true planetary emergency." Ten years later, he's probably hoping that everyone has forgotten about his categorical statement. The terrible truth for Gore is that there is no planetary emergency. Not one of the dire predictions he and the rest of the alarmist community made has come to pass. In fact, there is plenty of evidence that they have been running a racket. Global Warming Is a Myth. During the 20th century, the earth warmed 0.6 degree Celsius (1 degree Fahrenheit), but that warming has been wiped out in a single year with a drop of 0.63 degree C. (1.13deg;F.) in 2007. A single year does not constitute a trend reversal, but the magnitude of that temperature drop — equal to 100 years of warming — is noteworthy. Of course, it can also be argued that a mere 0.6 degree warming in a century is so tiny it should never have been considered a cause for alarm in the first place. But then how could the idea of global warming be sold to the public? In any case, global cooling has been evident for more than a single year. Global temperature has declined since 1998. Meanwhile, atmospheric carbon dioxide has gone in the other direction, increasing 15-20%. This divergence casts doubt on the validity of the greenhouse hypothesis, but that hasn't discouraged the global warming advocates. They have long been ignoring far greater evidence that the basic assumption of greenhouse warming from increases in carbon dioxide is false. Fabrications to Prop Up Climate Panic Are Among Greatest Scandals in History of Science. [Scroll down] All of this is just the tip of the iceberg. The frequency and magnitude of temperature fabrications, exaggerations, faultily done homogenizations, etc., to prop up panic about global warming are scandalous — among the greatest scandals in the history of science, I'd say. Scientists Expose Climate Shysterism and Flim-Flammery. [Book review:] A Disgrace to the Profession shows numerous serious scientists are outraged by the deception Pennsylvania State University climatologist Michael Mann has perpetrated on climatology. Mann sued author and talk show host Mark Steyn for describing Mann as a fraud in 2012. The suit alleges Steyn is guilty of defamation for attacking Mann's questionable and infamous scientific findings. Steyn is enjoying defending himself with the truth, and in this book he has assembled more than 100 scientists to support his position. The book, perfectly titled, is a wonderfully easy read. Steyn separates the scientists' comments into a dozen sections based on the focus of their critiques, such as tree rings, history, fraud, etc., and he opens each section with an essay of his own. Russia's Putin Says Global Warming Is 'A Fraud'. Russian President Vladimir Putin believes global warming is a "fraud" — a plot to keep Russia from using its vast oil and natural gas reserves. Putin believes "there is no global warming, that this is a fraud to restrain the industrial development of several countries, including Russia," Stanislav Belkovsky, a political analyst and Putin critic, told The New York Times. Will 2016 Be A Climate Hysteria Election? Will the climate campaign ever reach its "sell-by" date? Probably not: the deep need for belief in catastrophism — and the expansion of political power that is always deemed necessary to "solve" the problem — will persist even if we run out of witches to drown. Perhaps the most damaging trope of climate catastrophism is that "we only have X years left" before it will be too late. James Hansen said it was 2010. Al Gore thought the Arctic would be ice-free by last year. I'm pretty sure if I look I can find someone who said that Obama was our last hope. Australia PM's adviser says climate change a UN hoax. A top Australian government business adviser has said climate change is a hoax by the United Nations. Most climate models were wrong and there was little evidence of climate change, said Maurice Newman. He said the UN had used climate change as a "hook" to establish and control a new world order. The Mask Slips on the Climate Scam. We're always told that revenue from emissions trading or a carbon tax will be used for energy and climate change adaptation purposes. But Inslee has let the mask slip and made obvious that it is a lie. Liberal politicians especially are drooling for a carbon tax as a new revenue source. It isn't going to be rebated to taxpayers. It isn't going to be used as a bargaining chip for a decent tax reform. It's going to be used to pay for more government goodies. Kerry accused of exaggerating role as senator in early global warming hearings. "Climate change is an issue that is personal to me, and it has been since the 1980s, when we were organizing the very first climate hearings in the Senate," Kerry told the audience. "Al Gore, Tim Wirth and a group of us organized the first hearings in the Senate on this, 1988. We heard Jim Hansen sit in front of us and tell us it's happening now, 1988." The Washington Post fact-checker concluded that Kerry at least exaggerated about his involvement and — comparing his statements to recent tall tales by anchor Brian Williams — gave him four "Pinocchios." The myth of 'settled science' : When the left shuts down debate, it's time for skepticism. National Geographic's latest cover story has generated lots of attention because it sneers at those close-minded Americans — mostly conservatives, of course — who do not accept scientific "facts." Only 40 percent of Americans (according to Pew Research Center) "accept that human activity is the dominant cause of global warming," and the magazine finds it "dispiriting" that so many "reasonable people doubt science." National Geographic compares global warming doubters to those disbelieve NASA's moon landing and those who think water fluoridation is an evil plot. How could so many dismiss "established science?" Well, here's one reason: The public has come to distrust government warnings and the scientific experts; they are often wrong. David Suzuki, High Priest of Global Warming, Torn to Shreds on Australian Public TV. As the election of Tony Abbott indicates, Australians have had enough of the destructive global warming hoax. Canadian countermoonbat Ezra Levant has a good laugh at what happened when media-beloved high priest of global warming David Suzuki appeared on Australian public TV expecting the usual mindless adulation and instead was torn to shreds along with his hoax, revealing both to be utterly phony. Co-Founder of The Weather Channel: Global Warming Is a Complete Hoax. John Coleman, meteorologist and co-founder of The Weather Channel, told Megyn Kelly tonight that he doesn't believe global warming is real and laughed out loud at anyone who buys into what Al Gore is selling. Coleman recently wrote an open letter arguing, "There is no significant man-made global warming at this time, there has been none in the past and there is no reason to fear any in the future." He told Kelly it's tough to get a media platform these days when you're a climate skeptic "ever since Al Gore made it a plank of the Democratic Party." He blamed the media for hyping up the supposed threat of global warming and said there are plenty of scientists who have data completely refuting all of the conventional wisdom. Pressing the climate hoax. President Obama is preparing to use his executive authority to impose the carbon-dioxide limitations dreamed up by the climate hysterics when they meet next year in Paris. He intends to ignore his constitutional duty to ask the Senate's consent, and use the Environmental Protection Agency and other departments to impose the rules. Ignoring the Constitution can be habit-forming, as Mr. Obama has shown us. Apollo Astronaut: Climate Alarmism Is the 'Biggest Fraud in the Field of Science. Climate alarmism is "the biggest fraud in the field of science" and the 97% consensus claim is nonsensical, Apollo 7 astronaut Walter Cunningham tells MRCTV in a preview of his presentation at the upcoming Heartland Institute climate conference, July 7-9. "Since about 2000, I looked farther and farther into it," Col. Cunningham (USMC, Ret.) tells MRCTV in an exclusive interview. "I found that not one of the claims that the alarmists were making out there had any bearings, whatsoever. And, so, it was kind of a no-brainer to come to the conclusion." The Climate Change Scam. [T]he environmentalist movement has succeeded in persuading many people, even political leaders and prominent scientists, that the scientific knowledge of the climate that has accumulated over hundreds of years should be replaced by an environmental religious slogan blaming human emissions of so-called greenhouse gases for everything that happens[.] This scam was launched at the 1992 United Nations Earth Summit in Rio de Janiero. [...] But to put a scam like this over on the public there must be attribution, not only by the devotees of the environmentalist faith, whose support is guaranteed, but also by a collection of pundits who could influence politicians. You must have celebrities, film stars[,] sports heroes and scientists. Global Warming 'Fabricated' by NASA and NOAA. Scientists at two of the world's leading climate centres — NASA and NOAA — have been caught out manipulating temperature data to overstate the extent of the 20th century "global warming". The evidence of their tinkering can clearly be seen at Real Science, where blogger Steven Goddard has posted a series of graphs which show "climate change" before and after the adjustments. When the raw data is used, there is little if any evidence of global warming and some evidence of global cooling. However, once the data has been adjusted — i.e., fabricated by computer models — 20th century 'global warming' suddenly looks much more dramatic. This is especially noticeable on the US temperature records. Fake global warming is one of the most serious fake problems not actually facing our nation today. And the polar bears — oh, the polar bears! Studies reveal that over the last twenty years, as computer models of the climate have progressively damaged computer models of their habitat, the polar bear population has steadily increased. But that's only in real life! In the computer models, the poor creatures are dropping like flies. Let's examine the distorted facts. Politico Notices TV Meteorologists 'More Skeptical' of Climate Change Than Other Scientists. Politico's Darren Goode surprisingly highlighted the skepticism of many on-air meteorologists in a Monday item about President Obama's interviews with "some of television's most popular celebrities — weather forecasters — to ratchet up the volume on the administration's latest scientific assessment of climate change." Goode pointed out that "not all broadcast meteorologists have been conducive to the climate science message." The writer cited Weather Channel founder John Coleman, who labeled global warming "the greatest scam in history" back in 2007. Harry Reid's Less Than Magnificent Obsession. [Senator] Reid is obsessed with Charles and David Koch. This is at least the third time since October that he has attacked them by name. You might infer that Harry Reid hates rich people, but you would be wrong. He didn't mention it in today's tweet, but tomorrow, Reid will attend a Democratic Senate fundraiser at the home of billionaire hedge fund manager Tom Steyer, who has pledged $100 million to fan the flames of the global warming fraud. Prostituting Science. Global warming is a both scam perpetrated by greedy opportunists like Al Gore, as well as a cult composed of those disaster-dependent ding-a-lings among us who have no incentive in life if that life is not imminently threatened by whatever the latest perceived threat may be; and lastly by a bunch of avaricious academics willing to sell their scientific souls to that big government devil for a place to nose into the trough of federal funding for research. The ObamaCare lie and the global warming lie. Now that Americans have largely caught on that their government will lie to them to support the expansion of state power, America's progressives are in for a rough time ahead, according to Peter Ferrara, writing at Forbes. [...] Drawing on the work of S. Fred Singer and other leading global warming skeptics who have shown that the actual temperature evidence is contradicting the warmist hypothesis, Ferrara makes a fascinating comparison to other scientific frauds perpetrated in the name of enhancing state power. Extreme weather events are increasing: yet another green propaganda myth. [C]limate alarmists threw all moral compunction or intellectual integrity out of the window long ago. As we saw in the Climategate emails they smear; lie; twist data; temper with evidence; bully; exaggerate; abuse the scientific method... almost as a matter of routine. When you debate them in public, though, you imagine somehow that they'll rise to the occasion, that they'll behave a bit better when there are other people watching. They never do though. UN climate conference COP19 tells blatant lies to the public about sea level rise & snow cover. Sea levels have been rising naturally for the past 20,000 years since the peak of the last ice age, and at much, much faster rates in the past (up to 40 times faster than today). Sea level rise greatly decelerated about 8,000 years ago to rates similar to today. [...] Sea levels are currently rising 4 to 8 inches per century, and there is no acceleration, which means there is no evidence of a human influence on sea levels. Why Does The Global Warming Hoax Persist? The catastrophic anthropogenic global warming theory has now been, in my opinion, definitively refuted. Yet the global warming machine grinds on, oblivious to the science. Why? Because there is a great deal of money at stake. Obama's Executive Order on Climate. On the surface, it might seem to make sense for the President to want to "do something" about climate events such as hurricanes, but there have always been hurricanes and blaming them and everything from droughts to wildfires on "climate change" is not just absurd, it is a deliberate lie that blames a rise in the amount of carbon dioxide, a so-called but incorrectly named "greenhouse gas", as the cause of these natural events. The President has issued an Executive Order to ramp up efforts to address "climate change." At the heart of the global warming hoax has been this carbon dioxide lie, but there has been no warming for over 17 years and the many computer models that predicted it were wrong; many were deliberately false. Global Warming Is A Fraud: Three More Pieces Of Evidence. [Scroll down] Two related news items, though, shine a disinfecting light on [Al] Gore's toxic rhetoric: One, the U.S., according to USA Today, "is seeing its quietest year for tornadoes in more than a decade." USA Today also reports that "meteorologist Greg Forbes of the Weather Channel says 2013 is the third-quietest year, in records dating back to 1950." Two, Bloomberg News is reporting that there have been no Atlantic hurricanes through August for the first time in 11 years, though "predictions were for an above-normal season." The Northern Atlantic hurricane season ends Nov. 30, so there's time for a grand finale of storms. But that's unlikely. Global Government Gone Wild. The weatherman at KUSI-TV, John Coleman, the Weather Channel founder, had told Red Eye host on Fox News a long time ago that he wanted to sue Al Gore for global warming fraud. He said that "30,000 scientists among whom 9,000 have Ph.D.'s have signed on to debunk global warming." In spite of their efforts, global warming advocates have marched on, transforming how we obtain and use energy in this country and around the globe. Short Meteorological Memories. By the time the global warming hoax was in its final days, we were being told that mid-winter blizzards were signs of it. Now the charlatans have switched their message, calling it "climate change" and this is so bogus that it defies description. Of course the climate changes! Is it time to prosecute the IPCC for fraud? The IPCC, having spent almost two months working out how to respond to my complaint about a notoriously bogus graph in its Fourth Assessment Report, has found itself not guilty. In doing so, it is wilfully perpetuating a fraud, which will now be reported to the prosecuting authorities. The Global Warming Fraud. Newspapers, magazines, television programs, classrooms, and conversations all over America are awash in fraud which is being covered by the mantle of "science." The birth of the Global Warming Fraud can be traced to a conference organized by anthropologist Margaret Mead, in 1975. [...] Anyone who dares to challenge this sacred majesterium of "science" is a heretic and an ignoramus, according to advocates of The Global Warming Fraud. Nobody wants to be called stupid, much less really be stupid. The Continuing Collapse of the Global Warming Hoax. Directed from within the bowels of the most corrupt international organization on planet Earth, the United Nations, the hoax originally generated the Kyoto Protocols in December 1997 to set limits on the generation of carbon dioxide (CO2) emissions. The UN's climate charlatans claimed that CO2 was causing the Earth to dramatically warm. It was a lie. Fact-checkers rip Obama group's claim on climate change 'hoax' vote. A recent video from a President Obama-aligned group is under fire from fact-checkers for claiming hundreds of House members voted to call climate change a "hoax" — namely, because they didn't. The video from Organizing for Action cleverly splices together quotes from Republican climate change skeptics while building up to the factoid about the vote, which was on an amendment to a broader bill in 2011. The video then includes the following text: "Number of House members who voted in 2011 that climate change was a 'hoax': 240." The amendment, though, did not include the word hoax, and the circumstances of the vote were far more complicated than the video portrayed. Relentless Liars: The Great Green Edifice is Crumbling. The old guard of the environmental movement is passing from the scene and the entire edifice of the global warming hoax is crumbling. Jim Hansen, the head of NASA's Goddard Institute of Space Studies (GISS) since 1981 has announced his retirement. It was Hansen who told a congressional committee in 1988 that the Earth was heating up. That was the same year that the Intergovernmental Panel on Climate Change (IPCC) was established by two United Nations organizations, the World Meteorological Organization and the United Nation Environmental Program. Bad Science and Bad Journalism are a Bad Combination. Predictions such as appeared in Science are utterly bogus. They are based on rigged computer models which have been constantly exposed for their lies. Both the UN's Intergovernmental Panel on Climate Change and the U.S. government engage in this fraud. Protecting Global Warming Liars. The debasement of science continues as various elements, organizations and publications, and the mainstream media circle the wagons to protect those who continue to spread lies about global warming. [...] Considering that global warming is a lie from start to finish, one must conclude that all those involved have few, if any, qualms about lying. The Anatomy of Climate Science Hype. [Scroll down] It is customary in stories like this one for reporters to get the views of other experts, especially those who might disagree. There is no indication that this happened in this particular case. Global Warming Consensus Looking More Like A Myth. Yes, many climate scientists believe that emissions of greenhouse gases are heating the earth. Of course there are some who don't. But when confining the question to geoscientists and engineers, it turns out that only 36% believe that human activities are causing Earth's climate to warm. New Report: Man-made Global Warming Is a Farce. Extreme Weather Report 2012 was presented at the latest UN Climate Conference in Doha, Qatar, but the only press this landmark study received was when British politician and author Lord Christopher Monckton was kicked out of the conference for presenting it. Climate Change Is A Hoax, Obama, Like Your Presidency. The president who said he'd slow the ocean's rise says voters can regulate the weather and stop droughts, floods, wildfires and hurricanes by backing his re-election. Never mind wrecking the economy in the process. Climate Lies in Iowa's Supreme Court. Since the climate liars cannot make their case on the basis of the known science, taking it into a court of law with a passionate appeal to emotion in order to impose restrictions on carbon dioxide (CO2) emissions has long been a Green goal. The claim that CO2 causes "climate change" which is the new spin on "global warming" is utterly false, but it may be argued if the Iowa Supreme Court takes the case. Inhofe was first to declare global warming 'the greatest hoax'. There are easily more skeptics of global warming today than adherents. Support for many of the related causes of the pro-warming side — a carbon tax and "cap and trade" legislation to limit carbon emissions — have died down considerably. The Utter Desperation of Global Warming Liars. The more the public grows skeptical of the global warming hoax, the more desperate the charlatans behind it become. There is no global warming if by that one means a sudden, dramatic increase in the overall temperature of the Earth. It is not, nor ever was, caused by an increase in carbon dioxide (CO2) in the Earth's atmosphere; currently a miniscule 0.038 percent. Climate science has demonstrated that CO2 increases show up centuries after a major change in the Earth's temperature, not before. The Mother of All Hoaxes. The U.S. is floating on an ocean of oil, but for now it can only be extracted from lands owned privately because the Obama administration has done everything in its power to restrict access to it on federally owned lands and, of course, the billions of barrels locked up off-shore. In exactly the same way that the Obama administration has presided over the loss of billions in subsidies and loan guarantees for the solar panel companies or the ridiculous costs of wind power industry compared to a single coal-burning plant, at the heart of it all has been the claim the global warming is caused by "greenhouse gas" emissions, carbon dioxide, that imperil the Earth. Movie: The Great Global Warming Swindle. "The Great Global Warming Swindle is a controversial documentary film by British television producer Martin Durkin, which argues against the scientific opinion that human activity is the main cause of global warming. The film showcases scientists, economists, politicians, writers, and others who are sceptical of the scientific consensus on anthropogenic global warming. Publicity for the programme states that global warming is 'a lie' and 'the biggest scam of modern times." The Greatest Hoax? Global Warming, Says Sen. James Inhofe. [Scroll down] If it wasn't clear that the global warming theory was in trouble when the ClimateGate scandal erupted in 2009, showing the corruption in academia willing to "hide the decline" and suppress scientific studies and views that didn't conform to those of the "warmists," then it should have been when they largely dropped the term "global warming" and replaced it with "climate change." Who, after all, could disagree with the notion that the climate is changing? It has been changing since the beginning of time. One would have to be positively anti-science to make such a suggestion, a term thrown around a lot by the Left to describe the Republicans who ran for president this year. Globally Warmed Over: Hatred Unmasked at Last. Aspiring apparatchiks of the coming world dictatorship, tiring of the hopeless race against facts in their anti-industrial carbon dioxide hoax, have finally given up the pretense of science in favor of pure, old-fashioned doomsday preaching. Having been outlasted by reality in the pseudo-science of "global cooling," undone once again in the pseudo-science of "global warming," and ultimately laughed off the stage in the unfalsifiable quackery of "global climate change," it is apparently time at last for the advocates of tyranny in the name of Gaia to play their last card: global mass hysteria. Global warming hoax exposed by record global cold. One of the most dramatic results of the record cold over much of the planet is the reversal of the much-reported melt of the icebergs in the Arctic Ocean. Last autumn the world was alarmed to hear from certain climatologists that the ice in the Arctic had melted to its "lowest levels on record." What was carefully omitted from those scare stories was the fact that those records only date back as far as 1972, and that there is anthropological and geological evidence of much greater melts in the past. The EPA Wrecking Ball. The Environmental Protection Agency is using its power to advance the objective of the environmental movement to deny Americans access to the energy that sustains the nation's economy and is using the greatest hoax ever perpetrated, global warming — now called "climate change" — to achieve that goal. Global warming greed. It's only now becoming clear how many people have become rich thanks to the global-warming scare. Politicians from both parties have been so afraid of being labeled a "denier" that they'll vote for any piece of legislation bearing the trendy green label. The numbers are adding up fast. Inhofe warns EPA moving to regulate carbon. If President Obama's Environmental Protection Agency proceeds with plans to bypass Congress and restrict carbon emissions through regulation, it will be even more costly to Americans than "cap and trade" legislation, Sen. James Inhofe, R-Okla. predicted in an interview with the Washington Examiner this week. Back in 2003, Inhofe stirred controversy when he declared, "With all of the hysteria, all of the fear, all of the phony science, could it be that man-made global warming is the greatest hoax ever perpetrated on the American people? It sure sounds like it." Ever since, he's been one of the most recognizable and dedicated skeptics of global warming. Saving the Earth, One Fraud at a Time. If the theory of man-made global warming were such a self-obvious truth, the result of scientific consensus, then why do advocates for this idea keep committing frauds to advance it? Even more disturbing, why are some writers willing to defend this behavior? Omitted variable fraud. [Scroll down] So the 50% driver of global temperature according to mountains of temperature correlation data is assumed to have 1/40th the warming effect of something whose warming effect is not even discernable in the temperature record. This is on the input side of the GCM's. The models aren't using gigaflops of computing power to find that CO2 has that much larger a warming effect. The warming ratio is fixed at the outset. Garbage in, garbage out. British Parliament heard devastating testimony overturning the global warming hoax. James Delingpole of The Telegraph reports that the British Parliament heard devastating testimony overturning the global warming hoax from MIT's Richard Lindzen who is the Alfred P. Sloan Professor of Meteorology, Department of Earth, Atmospheric and Planetary Sciences. Global Warming Alarmists Resort to Hoax. We are remiss in not having written about the Peter Gleick scandal. Gleick is a founder of the liberal Pacific Institute and a member of the National Academy of Sciences. He is an expert on water resources, not climate; like many left-wingers in irrelevant fields of study, he has irrationally strong feelings about global warming. So, as Gleick has now admitted, he obtained documents from the Heartland Institute under false pretenses — that is, by lying — and published them in hopes of discrediting the Institute. All Hail Obama. [Scroll down] What US EPA originally dished out as a finding to deal with automotive exhaust, is now taking the time and attention of American utilities and manufacturers of all sorts of products, even before the courts have ruled on the original decision over CO2. I personally believe the cost and turmoil of the CO2 scare will likely go down in history as the costliest authoritarian myth since Hitler stirred up Germany with the notion of Aryan Supremacy. The Global Warming Hoax is Now Killing People. By Friday, February 10th, an estimated 500 Europeans had died from the freezing weather gripping the continent. This is the price they and British citizens are paying for embracing the global warming hoax, spending billions for wind power when they should have been building coal-fired and other sources of energy to heat their homes and businesses. When the Earth refuses to warm. Global warming, which was mostly a scam invented by researchers looking for government grants, is over. The great warming phenomenon, which was supposed to have sent polar bears to vacation in Miami Beach by now, ended in 1997. America's worst regulatory agency outdoes itself. California continues its leading role as the national laughingstock of regulatory absurdity. This week, the California Air Resources Board (CARB), forged another link in its unbroken chain of disastrous environmental policies. ... Do you think that all this hooey from Al Gore and the global warming crowd what just a well orchestrated con game to scare taxpayers into funding billions of dollars of new bureaucracies? Was global warming just another consumer product, advertised and sold like mouthwash by the MSM to an indifferent and scientifically uneducated population? [Most assuredly], that is exactly what happened. Obama on Energy: An Exercise in Nuance. Obama's "Green Energy" policies are based on the global warming hoax. His decision to cancel the Keystone XL Pipeline project pleased environmentalists, but at the cost of 20,000 jobs. And "global warming" is Obama's scare tactic. Children just aren't going to know what sun is. So, to recap: a scientist from arguably Britain's most discredited university department — the Climatic Research Unit at the UEA — made a fool of himself and his employer by feeding to a newspaper wrongheaded disaster scenarios based on woefully inaccurate computer projections, thus lending spurious credibility to a massive media scaremongering campaign which has led to the squandering of billions of pounds on an entirely unnecessary scheme to "decarbonise" the UK economy. His reward for this was to be granted a taxpayer-funded salary to go round the world spreading more abject nonsense about a mostly non-existent threat called "climate change." [Dr David] Viner is not the exception: he is the rule. We have a right, I think, to start getting very angry indeed. Eco-Absurdity: Billions of dollars have been wasted on claims of a massive increase of carbon dioxide (CO2) in the Earth's atmosphere and entire careers, organizations, and government agencies have been financed to advance the hoax. So much depends on this cash flow that the fraud's machinery continues to function. Green Energy Skepticism. Ivar Giaever, a Nobel Prize-winning physicist, resigned from the American Physical Society because of its position on global warming. So did University of California professor Hal Lewis. When Lewis resigned, he said that the global warming movement was a "scam" and a "pseudoscientific fraud." Even so, our government is imposing strict controls to reduce greenhouse gas emissions in hopes of staving off global warming even though earth's atmosphere is cooling. Meanwhile, the cost to you and me is higher energy prices, higher inflation, a lower standard of living, and fewer new jobs, since every product we buy has an energy cost component. "Definitive" Global Warming Study Criticized As Fraud. One of the pivotal studies in the global warming debate has been called out as a fraud... by one of the top members of the team that prepared it. The study purported to show definitive proof that the Earth has been warming since 1950, but in truth the data shows the exact opposite — global temperatures have been almost perfectly flat. No warming, no cooling, no "climate change" at all. The Climate Scam Continues. In an attempt to revive climate hype, a chart by a Berkeley scientist claims to show global warming has not slowed. In fact, what it shows is no warming for the last 11 years. The Make-Believe World of Global Warming. What is perhaps the biggest hoax in history is unraveling before us today. It has been a terrible and destructive fraud on the people. ... This hoax has resulted in bad policies and a tremendous unnecessary expense to the world. Those responsible should receive just punishment and ridicule for their misdeeds. For the last 10 to 15 years, we have not even had global warming — we have been in a period of global cooling, and knowledgeable scientists predict that this cooling will continue for some time. Man-made "greenhouse gasses," and CO2 in particular, have little, if anything, to do with global warming or global cooling. The Climate Crisis Hoax. A hoax is a deceptive act intended to hoodwink people through deliberate misinformation, including factual omissions. ... The central lie is that we are experiencing a known human-caused climate crisis, a claim based on speculative theories, contrived data and totally unproven modeling predictions. And the evidence? Much is revealed by politically corrupted processes and agenda-driven report conclusions rendered by the United Nations Intergovernmental Panel on Climate Change (IPCC), which are trumpeted in the media as authoritative gospel. Global Warming: the Guilty Men. [Scroll down] How did they get away with this stuff? It's a question I find myself asking time and again of all those establishment figures using every manner of dirty trick to promote the Man Made Global Warming scam. A Successful Fraud. Global warm-mongers say they can't name a single scientist who doesn't agree with them. Well, here's one: Nobel laureate Ivan Giaever, who just left a scientific society because he believes the debate isn't over. On Being Governed By Scientific Frauds. The more I think about it, the more it looks like global warming is a deliberate attack by the postmodern (anti-science) left on science. Global Frauding attacks all the core scientific values -- of truth-telling, empirical discipline, and skepticism. The Global Warming Hoax In Charts. The remarkable thing about the anthropogenic global warming hoax is that it isn't even a close call. Anyone who takes the trouble to investigate the science will quickly learn that the alarmist position is a fraudulent one, driven, I think, by the billions of dollars that are thrown at those who are willing to sell out scientific method in support of the statist line. Hiding the decline is way more lucrative than presenting objective, and unalarming, scientific findings. The Make-Believe World of Global Warming. What is perhaps the biggest hoax in history is unraveling before us today. It has been a terrible and destructive fraud on the people. The evidence is now clear that the idea that we have global warming to a dangerous degree which is caused by man-made "greenhouse gasses," and that it can be changed by cutting down on carbon dioxide (CO2) emissions, is decisively flawed, if not a complete fraud in all aspects. There is no question that it has been fraudulently presented to the people. The Greens Just Love Us to Death. [Scroll down] In case I didn't mention it, "global warming" was a complete hoax, a fraud concocted by the United Nations Intergovernmental Panel on Climate Change in order to gin up a market for the sale and trade of "carbon credits." Anyone — and I mean anyone — who tells you that humans are causing climate change is a charlatan or a dupe. Avoid them. My general recommendation is to avoid anything that has the word "green" attached to it. You are being conned into spending more for something than necessary. You're paying for the hysteria of our politicians. [Scroll down] Whatever happens now, whether it is hot or cold, whether we get heatwaves or record snowfalls, floods or droughts, sooner or later we hear those familiar little voices piping up to tell us that the blame for all these 'extreme weather events' still lies on 'disruption' to the climate caused by the sinful activities of mankind. They're all at it — from the environmental activists of Greenpeace, the WWF and their allies in the BBC and the Met Office, to those thousands of scientists across the world who have received billions in funding from governments investing in climate change research and prevention — all still battling to keep in being the greatest scare story in the history of the world. Earth Day and Environmental Insanity: Anyone who has been paying any attention to the environmental movement has got to have concluded it is insane. ... We are only now recovering from the greatest fraud of the modern era, "global warming." The United States wasted an estimated $50 billion on so-called scientific research, all of which existed for the purpose of advancing this hoax. It is rarely mentioned any more except for its fraudulent new name, "climate change." How to Get Rich from Liberal Delusions. Global warming fraud is now in the midst of a slow collapse. The Chicago Carbon Exchange just closed, because the investors figured out the scam. The $10 Trillion Climate Fraud. While senators froth over Goldman Sachs and derivatives, a climate trading scheme being run out of the Chicago Climate Exchange would make Bernie Madoff blush. Its trail leads to the White House. ... The Chicago Climate Exchange (CCX) advertises itself as "North America's only cap-and-trade system for all six greenhouse gases, with global affiliates and projects worldwide." Barack Obama served on the board of the Joyce Foundation from 1994 to 2002 when the CCX startup grants were issued. As president, pushing cap-and-trade is one of his highest priorities. Now isn't that special? UN subterfuge: The global warming hoax. Today, Americans perceive global warming as a low priority item, and have turned their attention to our economic and security concerns. But big government agencies (UN and US) and Non-Governmental Organizations (NGOs) continue to quietly expand UN influence, by teaching their insidious Marxist policies to the bureaucratic, naive, and idiotic. "These folks seem to have sub-specialties in the "three-card monte" sub-species of science." Unequivocal Equivocation — an open letter to Dr. Kevin Trenberth. The first part of Dr. T's statement is true. There is general scientific agreement that the globe has been warming, in fits and starts of course, for the last three centuries or so. And since it has been thusly warming for centuries, the obvious null hypothesis would have to be that the half-degree of warming we experienced in the 20th century was a continuation of some long-term ongoing natural trend. But that's not what Dr. Trenberth is doing here. Keep your eye on the pea. He has smoothly segued from the IPCC saying "global warming is 'unequivocal'", which is true, and stitched that idea so cleverly onto another idea, 'and thus humans affect the climate', that you can't even see the seam. The pea is already under the other walnut shell. More warmist alarmism debunked. President Obama and the Democrats still believe that addressing "climate change" is an imperative in setting national energy policy. There seems to be a significant lag in the ability of Democrats to process new information that proves the theory of AGW is a fraud. "It is the greatest and most successful pseudoscientific fraud I have seen in my long life"
US physics professor resigns from APS. Harold Lewis is Emeritus Professor of Physics at the University of California, Santa Barbara. Here is his letter of resignation to Curtis G. Callan Jr, Princeton University, President of the American Physical Society. My Resignation From The American Physical Society. [Scroll down] It is of course, the global warming scam, with the (literally) trillions of dollars driving it, that has corrupted so many scientists, and has carried APS before it like a rogue wave. It is the greatest and most successful pseudoscientific fraud I have seen in my long life as a physicist. Anyone who has the faintest doubt that this is so should force himself to read the ClimateGate documents, which lay it bare. I don't believe that any real physicist, nay scientist, can read that stuff without revulsion. An important moment in science history. I would describe it as a letter on the scale of Martin Luther, nailing his 95 theses to the Wittenburg church door. It is worthy of repeating this letter in entirety on every blog that discusses science. What I would really like to see though, is this public resignation letter given the same editorial space as Michael Mann in today's Washington Post. The "Greenhouse Effect" Hypothesis. The "greenhouse effect" hypothesis of CO2 is based on the claim that Oxygen and Nitrogen do not absorb infrared radiation. Only "greenhouse gases" absorb infrared according to this hypothesis. It has been necessary to falsely claim that Oxygen and Nitrogen are transparent to infrared radiation in order to demonise CO2 and other gases and blame them for causing atmospheric warming. All gases absorb and re-emit infrared radiation. The fallacy of CO2 "greenhouse effect" is the keystone of AGW fraud. Three More Outrageously False Statements from NOAA. Jay Lawrimore, climate analysis chief at NOAA's National Climatic Data Center, said: ["]It's part of an overall trend. Global temperatures have been rising for the last 100-plus years. Much of the increase is due to increases in greenhouse gases. ["] There are many things wrong with this statement. First, the most obvious, eh, problem: the year was only half over at the time. If your horse leads halfway through the race, do you get to collect your winnings? Carbon Dioxide Riches Disappear. Since 1988, when the United Nations created the Intergovernmental Panel on Climate Change (IPCC), the vast global warming hoax existed for two purposes, the enrich those involved and to impose a one world government. The effort required mobilizing the leaders of nations to spread the word that the planet was dramatically warming and that carbon dioxide was the cause. One has to marvel at the audacity of this scam. Were You Fooled By The Biggest Hoax Ever? Being taken for a fool was never an easy thing to admit and when it came to the biggest, most expensive hoax ever committed on modern man, even the brightest people were taken in, especially if they were of a liberal mindset. Conservatives are more likely to question everything that comes from the mainstream media, so most were skeptical from the start. Cap-and-Trade: A Scam Based on a Scam. The entire global warming theory has been a scam, a hoax and a fraud from the day it was first put forth. Its advocates, corrupt scientists, corrupted science journals, and all of the environmental organizations are hoping the same Congress that foisted Obamacare on Americans will do the same with Cap-and-Trade. The Renewable Electricity Standard is a Hoax, a Fraud, and a Rip-Off. The U.S. Senate's proposed Renewable Electricity Standard (RES) would force electric utilities to generate a large and increasing percentage of their power from wind and solar — rising to 15% by 2021. ... The hoax part of the RES is that "clean electricity" is being advertised as a way to save the earth from the "dreadful fate" of anthropogenic global warming (AGW). To accept this outlandish proposition, one would have to believe that the carbon dioxide generated in the burning of fossil fuels has a noticeable influence on climate. The data argue against it. The constantly advertised "scientific consensus" is phony; it does not exist. Hockey Stick: The Sequel. 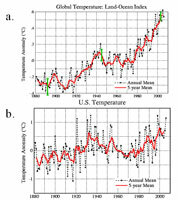 Michael Mann's infamous "hockey stick" graph, which purported to show steady temperatures on Earth for around a millenium until the 20th century, is the source of much of the misguided hysteria that surrounds the global warming movement. Mann achieved the hockey stick through mathematical errors or mathematical tricks, take your pick. Recently Virginia's Attorney General, Ken Cuccinelli, filed a Civil Investigative Demand for documents from the University of Virginia relating to the work done by Mann while he was at the University. Cuccinelli wants to know whether taxpayer funds were used to help Mann perpetrate a hoax. Leaving Liberalism. [Scroll down] Liberals vigorously guard the feel-good. And so we find that rational people who methodically weigh evidence are shouted down by virtue-flaunting ideologues. Take the global warming hoax. Pope Al, Bishop Boxer, and other Church of Global Warming officials still preach the doctrine even though their cathedrals are burning down. The grand scam marked a first: Mainstream media adopted a religion other than liberalism. The media and the Church perpetuated wacky beliefs based on bogus theories that created bogus projections derived from bogus studies. Cap-and-Trade Treason. Global warming has been exposed as a massive hoax and fraud. Why would the United States Senate proceed to enact a bill based on it? In essence, it will make some corporations, utilities, and people very rich and impoverish the rest of us. Having passed the House, the Senate will be handed a huge bill that, like healthcare, few will have read before they vote. It will impose the largest tax the nation has ever seen. Global Warming Farce Crashes Down. It has been a standard ploy of the Warmers to revile the skeptics as whores of the energy industry, swaddled in munificent grants and with large personal stakes in discrediting AGW. Actually, the precise opposite is true. Billions in funding and research grants sluice into the big climate-modeling enterprises and a vast archipelago of research departments and "institutes of climate change" across academia. It's where the money is. Skepticism, particularly for a young climatologist or atmospheric physicist, can be a career breaker. The red-hot scam unravels. Not everybody is on to the global-warming scam, not yet, but all the people — or enough of them — are getting there. "Global warming," or even "climate change" as Al's marketing men now insist that it be called, is becoming the stuff of jests and jokes. IPCC Discredited, Evidence of Scientific Fraud Mounts. The release of emails and scientific documents from the Climatic Research Unit of the University of East Anglia in Britain has triggered a cascade of revelations that could spell the end of what some critics are calling the "great global warming delusion." More errors in temperature data: As the frigid winter days pass and the scandals mount, it becomes clear that claims of man-made global warming aren't based on scientific methods at all. The hysteria is based on fraud. Anthropogenic Global Warming is a Farce. Deceitful manipulation of data, concealment or straightforward destruction of inconvenient evidence, vindictive conspiracies to silence critics, are par for the course in all scientific debate. But in displaying all these characteristics, the CRU e-mails graphically undermine the claim of the Warmers that they command the moral as well as scientific high ground. It has been a standard ploy of the Warmers to revile the skeptics as whores of the energy industry, swaddled in munificent grants and with large personal stakes in discrediting AGW. Actually, the precise opposite is true. The Hottest Hoax in the World: It was presented as fact. The UN's Intergovernmental Panel on Climate Change, led by India's very own RK Pachauri, even announced a consensus on it. The world was heating up and humans were to blame. A pack of lies, it turns out. Global Warming as Climastrology. The real reason for "global warming" is now clear beyond any reasonable doubt. The reason is ten trillion dollars in taxpayer dough for politicians, transnational bureaucrats, and phony science types. Put away those old world records for the Great Train Robbery and Bernie Madoff. You can junk Bonnie and Clyde. The climate fraudsters have now set the biggest record for massive fraud in human history. Global warming just another statist hoax. [Scroll down] The statists now refuse even to discuss the issue. Al Gore said recently that, "We have long since passed the time when we should pretend this is a 'on the one hand, on the other hand' issue. It's not a matter of theory or conjecture ..." We have lately learned why Al demurs. Global warming, it turns out, is the biggest hoax since the Community Reinvestment Act. They made it up. They not only made it up but also bragged about it to each other in hundreds of e-mail recently made public. Enviro-Marxists discover the real scourge of the planet: human beings. "Climate change," the scam formerly known as "global warming," has been exposed as the crypto-Marxist hoax many of us suspected for years that it was. In Copenhagen, at the ridiculous charade of a "summit" on the dangers of carbon emissions producing record carbon emissions, the lofty rhetoric about saving the planet and the long-suffering polar bears has been ripped down like a sheet covering an unfinished masterpiece. The great green fraud. Till now, I have avoided more than very limited comment on the whole global warming - carbon emissions controversy. But now that colossal spending and regulating programs impend on these issues, I must say that the Al Gore - David Suzuki conventional wisdom hysteria is an insane scam. Climategate: Beyond the Sleazy Science, Rotten Economics. The United Nations "climate" summit is upon us ... And here's the beauty of this grand scam. Not only is it based on unsound "findings" with the UN claiming a "consensus" that never was, based on "science" that was something other than scientific. Beyond that, if anyone cares to venture further, lie boundless vistas of bad economics. None Dare Call It Fraud. Imagine the reaction if investment companies provided only rosy stock and economic data to prospective investors; manufacturers withheld chemical spill statistics from government regulators; or medical device and pharmaceutical companies doctored data on patients injured by their products. Media frenzies, congressional hearings, regulatory investigations, fines and jail sentences would come faster than you can say Henry Waxman. If those same standards were applied to global warming alarmists, many of them would be fined, dismissed and imprisoned; sanity might prevail, and the House-Senate cap-and-tax freight train would come to a screeching halt. Obama's new world order. Global warming is the greatest fraud of our time. The overwhelming scientific evidence shows that, ratherthan getting hotter, the Earth's temperatures are cooling. Increasing numbers of leading scientists are challenging the flawed computer models used by eco-alarmists. It's never been about global warming. Anyone who believes that the Kyoto Accord and all the subsequent meetings spearheaded by the UN's Intergovernmental Panel on Climate Change (IPCC), is actually about global warming or climate change, would be well advised to submit a wish list to Santa Claus in care of the North Pole. Chances of having jolly St. Nick deliver what's on that list are better than the chances of stopping global warming. That's because global warming has already stopped with no help from Al Gore and his friends. The Greatest Scam in History. According to the perpetrators of the global warming scam, there is supposed to be a total consensus that what they call "global warming" is a major threat to earth's future. [John] Coleman is one of many meteorlogists who disagree with some or all of their claims. S. Fred Singer is another who questions such claims. The two of them together have over 100 years of experience studying weather. Coleman founded the Weather Channel. Singer was the first head of the National Weather Satellite Service. I Accuse! I accuse the United Nations environmental program in general and the Intergovernmental Panel on Climate Change in particular of creating a huge hoax, "global warming," in order to reduce energy use and to create a phony market for so-called "carbon credits," based on the lie that carbon dioxide plays a critical role in the alleged warming process. The Earth is not warming. It is cooling. Meteorologists, climatologists, and solar physicists agree that it has been cooling for at least a decade, and they predict the cooling will continue for several decades to come. Journalists protest Global Warming spin cycle. Even journalists are beginning to revolt at tactics the government is now using to spin the Global Warming myth. Controversy erupted this week at the World Conference of Science Journalists over the National Science Foundation's "underwriting" of media projects. It turns out that the NSF, which is heavily invested in propagating the Global Warming party line, has been quietly producing content for news outlets, content which the casual observer might not recognize for the propaganda it is. America Needs a Climate Change Revolt. Let me state this as plainly as possible: Global warming is a hoax designed to provide a crisis that will lead to a spreading-of-the-wealth among nations. Here at home, it will greatly increase the power of the government and Central Planning. If the government wants your thermostat set at 72 degrees, then that it what it shall be. The U.S. Government's Climate Con-job. Suppose a company doctored data, misrepresented study findings, replaced observations with computer simulations and hired PR flacks to promote its new "wonder drug." News stories, congressional hearings and subpoenas would be in overdrive. Fines and jail sentences would follow. And rightly so. But the standards change when "climate catastrophe" is involved. The Great Global Warming Deception. The Oregon Institute of Science and Medicine has a video/slideshow presentation which shows once again that worshippers of the religion of global warming are full of hot air. Al Gore and fellow socialists at the UN Intergovernmental Panel on Climate Change (IPCC) — a political organization, not a scientific one — and elsewhere desperately want people to believe the earth is going through unprecedented warming... and that it's all the fault of those evil coal-burning, SUV-driving capitalists. Unfortunately for them, this crazy idea not only doesn't meet the test of science, it doesn't even pass the smell-test. Nancy's Nazis: Both Hitler and Stalin hated real science. They had real scientists sent to concentration camps. The reason is of course that real science is about telling the truth. That is why "global warming" is also a totalitarian scheme; it's fraudulent science. It is also why the Left cannot openly debate the pros and cons of Central Planning in American medicine. They are not happy with searching out the truth. Global Warming Scam To Cost Americans Trillions. This proposed global warming tax-and-spend scam would be one of the biggest financial assaults ever perpetrated against a free people. Forgetting for a moment that the whole anthropogenic global warming myth is the biggest fraud ever sold to a free people, the plans the Obama Administration has to lighten the pockets of the American people is truly staggering. Ignoring Science: A new scientific paper says that man has had little or nothing to do with global temperature variations. Maybe the only place it's really getting hotter is in Al Gore's head. Because he must be getting flustered now, what with his efforts to save the benighted world from global warming continually being exposed as a fraud. Global Warming Hoax Weekly Round-up. Yesterday was Earth Day, so what better way to cleanse the palette (sic) from the green deluge of feel good hippy nonsense than 100 links of skeptical goodness. Go get a beverage and a cushion, this may take a while. Ex-WLS weatherman calls warming 'greatest scam in history'. John Coleman is best known in Chicago for being a popular part of WLS Channel 7's Eyewitness News Team from the late 1960s through the 1970s. He would later serve as the weatherman on "Good Morning America" and create the Weather Channel. But in some circles, Coleman is known for challenging the idea of global warming, calling it "the greatest scam in history." "It is a hoax. It is bad science. It is hijacking public policy," says Coleman, now a forecaster in San Diego. The Great Global Warming Hoax? We're reminded of an earlier story, which happened back in 1912. This was the amazing discovery of a skull and jawbone in which was quickly named the Piltdown Man and which all the world's archaeologists immediately accepted as a hitherto unknown form of early human. It appears no one bothered to examine it closely, assuming that other scientists had thoroughly investigated and vetted it. The hoax wasn't uncovered until 1953, when it was learned that the skull was that of a modern man and the jaw that of an orangutan. Seems no one had ever bothered to take a really close look at the artifact. Well, folks, it does appear we have a new, 21st Century Piltdown Man, and this time we know his name. He's called "Anthropogenic Global Warming." Die, Global Warming, Die! Ever since the "global warming" lie began, for at least two decades or more, I have been writing about what a huge hoax it was and is. For all that time I believed that if the truth got out and reached enough people, they would conclude it was a lie. ... The utterly vile politicians advancing this ... had better begin to pay some attention to public opinion on the subject because the Gallup, Zogby and Rasmussen polling organizations all are reporting that large majorities of people no longer believe their lies. A Cooling Trend Toward Global Warming. Over the past several years, it appeared that our society was doomed to succumb to what Weather Channel founder John Coleman has described as "the greatest scam in history": anthropogenic (human caused) global warming (AGW). For two decades there has been an incessant drumbeat of propaganda attributing every weather-related event to an increase in carbon dioxide caused by the burning of fossil fuels. With the election of a president who is solidly in the global-warming-alarmist camp ... the passage of legislation causing some form of economy-crippling energy taxation seemed to be a foregone conclusion. Global warming is a hoax. This whole global warming thing is a hoax. French President Jacques Chirac has let the cat out of the bag. He warned that if the United States did not sign the Kyoto climate protocol agreements, a carbon tax on goods could be imposed to try to force compliance. A long time ago, I laughed when someone told me the government would eventually tax everything, including the air we breathe. A carbon tax is putting a price on carbon dioxide emissions — essentially, taxing those emissions. The Greatest Scam in History. Victims of the global warming scam have done nothing to make themselves victims, particularly those who are unemployed through no actions they have taken. Those who could have been employed constructing clean coal powered electric plants are unemployed because the perpetrators of the global warming scam have stopped construction of those plants. The Amazing Story Behind Tho Global Warming Scam: The key players are now all in place in Washington and in state governments across America to officially label carbon dioxide as a pollutant and enact laws that tax we citizens for our carbon footprints. Only two details stand in the way, the faltering economic times and a dramatic turn toward a colder climate. The last two bitter winters have led tthe public to be skeptical that any runaway global warning. There is now awareness that there may be reason to question whether CO2 is a pollutant and a significant greenhouse gas. How did we ever get to this point where bad science is driving big government? And how will we ever stop it? Reasons Why Global Warming Might Not Actually Exist: Skeptics have long argued that there are other explanations for climate change other than man-made CO2. As Christopher Booker explains, there are many arguments put forward by those who believe that global warming is all a hoax. Outside The Law: James Hansen, the NASA scientist primarily responsible for the global warming scare, has grown weary of trying to change the world through the legislative order outlined in our Constitution. "The democratic process doesn't quite seem to be working," Hansen told the British Guardian newspaper Wednesday. "I think that peaceful demonstration is not out of order, because we're running out of time." The Farce of Global Warming. Wholesale acceptance of human-caused global warming does not, in fact, exist. Indeed, many scientists believe that the highly politicized global warming scare is one of the greatest scams inflicted on the planet. They hold it responsible for enforced political restrictions on legitimate scientific inquiry and dissent and feel that a deliberate attempt has been made to silence prominent atmospheric and climate scientists who offer legitimate criticism. The Great Global Warming Swindle. A very large section of the world's population still does not enjoy the benefits of electricity. ... These people burn wood or dried dung in their homes to cook their food. They have no artificial light or heat in their homes (huts). Their wretched fires give off horrific amounts of smoke and eat up fuel (trees). When it gets dark they must sleep. When it gets cold they shiver (it gets cold in Africa too you know). And of course no electricity also means there are no fancy things like water purification plants. ... Getting electricity is a matter of life and death for about a third of the world's population. Africa has coal and oil, but the greens say these must be left untouched. This is barbaric. Battle of the climate scientists, part 1. Bill Gray has long been warning that the threat of manmade climate change is not real. In his own words, "I am of the opinion that this is one of the greatest hoaxes ever perpetrated on the American people. I've been in meteorology over 50 years. I've worked damn hard, and I've been around. My feeling is some of us older guys who've been around have not been asked about this. It's sort of a baby boomer, yuppie thing." Battle of the climate scientists — Gray versus Hansen part 2. For those that aren't familiar with him, Dr. Gray is a Professor Emeritus of Colorado State University who is best known for his hurricane forecasts. He is a highly trained and respected meteorologist with decades of practical experience in monitoring the earth and its climate. In the letter he points out that Dr. Hansen, head of NASA's Goddard Institute for Space Studies (GISS), is not a trained climatologist nor a meteorologist. His formal background is actually in astronomy which does make one wonder how he has become one of the primary mouthpieces for anthropogenic global warming (AGW), or manmade climate change. Battle of the climate scientists — Gray versus Hansen part 3. The science behind the theory of anthropogenic global warming (AGW), or manmade climate change, has been said to be 'settled'. The United Nation's Intergovernmental Panel on Climate Change (IPCC), Al Gore, and Dr. James Hansen make up a triumvirate of climate change advocates. Wielding studies, computer models, and various charts and analyses, they believe man is heading down the road to self-destruction of we do not reverse course immediately and do everything and anything to stop what they believe is an unnaturally warming climate. That Famous Consensus: Yet another example of the 'research' masquerading as science that is used to reinforce the man-made global warming fraud. One of the difficulties the green zealots have had is that Antarctica has been not warming but cooling, with the extent of its ice reaching record levels. Documenting the global warming fraud. Global warming theory represents one of the greatest scientific con games in history. The putative intellectual foundations are based on data manipulated to support the desired conclusion, and have been conclusively debunked. Is the green lobby destroying the planet? Have you noticed how the grins on the faces of the global warming crowd are starting to look increasingly sickly? Even climate change zealots are starting to wonder if they've been guilty of scaremongering. "A Scam, With No Basis In Science". Our friend William Katz has been corresponding with physicist and mathematician Frank Tipler at Urgent Agenda on the subject of global warming. A few excerpts from Professor Tipler's letter to Katz: "As regards global warming, my view is essentially the same as yours: Anthropogenic Global Warming (AGW) is a scam, with no basis in science." the claim that carbon dioxide in the exhaust from your car and in the smoke stacks of our power plants is destroying the climate of planet earth. What an amazing fraud; what a scam." Powerful Documentary Trounces Man-Made Warming Hoax. An astounding documentary that was broadcast in the UK [3/8/2007] completely trounced the man-made explanation for global warming, not with emotionally-laden propaganda or by attacking the messenger as its adherants resort to, but by presenting carefully considered and rational science. The Great Global Warming Swindle brought together a plethora of scientists, professors, climatologists and weather experts to expose the myths about climate change that have been promulgated in order to hoodwink the world into accepting the man-made theory of global warming. Gore the Vandal: [Al] Gore epitomizes what I suspect future generations will call "The Great Global Warming Hoax", but in the meantime, he is able to generate the bogus science and anti-energy propaganda that is at the core of environmental ideology. If it is possible, Great Britain is infected even worse with this idiocy. The great carbon con: Can offsetting really help to save the planet? For the environmental groups Greenpeace and Friends of the Earth, this forestry offsetting craze is acting as a smokescreen, and detracting from real solutions to escalating emissions. "Taking a dodgy accounting proposition, which is that you can somehow identify the amount of carbon that any given new bit of forest picks up out of the atmosphere and sequesters, and make that correspond somehow to emissions elsewhere," is how Greenpeace sees carbon offsetting, according to its senior climate adviser Charlie Kronick. Environment minister Sammy Wilson thinks man-made climate change is a con. Spending billions on trying to reduce carbon emissions is one giant con that is depriving third world countries of vital funds to tackle famine, HIV and other diseases, Sammy Wilson said. The DUP minister has been heavily criticised by environmentalists for claiming that ongoing climatic shifts are down to nature and not mankind. The High Cost of a Hoax: "Effectively, this (new study) means that the global economy will spend trillions of dollars trying to avoid a warming of [approximately] 1.0°K. by 2100 A.D." Dr. [Ian] Wilson wrote in a note to the Senate Environment and Public Works Committee on August 19, 2007. Wilson, a former operations astronomer at the Hubble Space Telescope Institute in Baltimore MD, was referring to the trillions of dollars that would be spent under such international global warming treaties like the Kyoto Protocol. If the global warming fanatics have their way, you'll be paying a lot to finance a hoax, a scam, and a covert scheme to impose socialism on the U.S. and the rest of the world. The High Cost of the Global Warming Scam: [John] Coleman is the latest expert to declare that global warming is a hoax, yet its advocates in Congress and among Democratic candidates for their party's presidential nomination are promising to saddle the American people with laws designed to stop something that is not happening: laws that will have many of us in the poor house. Global warming: the new eugenics. The eugenics movement and the global warming movement are similar in many respects. Both ideas were introduced by scientists, advanced by politicians, popularized by the media, embraced as a moral necessity, resulted in severe consequences, and eventually rejected as harmful hogwash. Eugenics, thankfully, has run its course. Global warming, however, is approaching its zenith, just before imposing severe consequences, and is, perhaps, still a generation away from being rejected as the hogwash it is. Stop the CO2 scare, before it's too late. The significance of this can scarcely be overestimated. At just the moment when, thanks to the overwhelming pressure generated by the IPCC, the world's politicians, led by the EU, are committing us to spending untold trillions of pounds, dollars and euros on measures to "mitigate" the claimed effects of man-made warming, here is a galaxy of experts producing hard evidence that — if the problem exists at all — the official explanation for it is oriented in wholly the wrong direction. Global Deception: The Exaggeration of the Global Warming Threat. The basis for belief that increased global warming intensifies hurricanes is a single paper. The assumptions in the paper were quite unrealistic — including the physically incorrect notion that hurricanes do not cool the oceans over which they pass. A subsequent review article found no basis for an expectation of major changes in hurricane severity. The Anatomy Of A Hoax: Hoaxes have always been around. People have fallen for them en masse for centuries. In the recent past, we had an Ice Age scare in the 70's, then we proceeded to an overpopulation scare, then there was Y2K and now Global Warming. Remember the Hole In The Ozone Layer? Has that been fixed or did it just go away or was it a natural, reoccurring phenomenon? What is it about hoaxes that overwhelm great numbers of people with panic and sends them running off to spend money and do the bidding of the huckster? N.J. Legislator Says Global-Warming Regs Blown Away by New Scientific Data. Following the end of the sun's most active period in more than 11,000 years, the past 10 years have displayed a clear cooling trend as temperatures post-1998 leveled out and are now decreasing. Earlier this year, prominent meteorologist John Coleman, founder of The Weather Channel, stated that manmade global warming is "the greatest scam in history," adding, "I am amazed, appalled, and highly offended by it. Global warming; it is a scam." Coleman said the theory of global warming is based on fraudulent science. Global Warming is a Hoax. The majority of warming seen in the past occurred before 1940, and the remained of the climate model does not predict a drastic future warming. The warming before 1940 occurred much before our large scale use of carbon fossil fuels and could easily be attributed to natural warming of the earth from a natural cooling period. This pre-1940 warming accounts for 2/3 of the increase in global mean temperature observed up to 1997. Additionally, the evidence from the NASA satellites indicates that no significant warming has occurred since 1979. Global Warming "Bait-and-Switch". Global warming bait-and-switch starts with simple statements that few would contest — then shifts seamlessly to claims that are hotly disputed and supported by little or no evidence. The bait: Global warming is real. The switch: Global warming is intensifying and threatens agriculture, human civilization and the fabric of life everywhere on earth. The Global Warming Hoax: Global warming is a classic scare campaign initiated by the Greens after a previous effort in the 1970s to influence public policy by declaring a coming Ice Age failed to generate any response. What we are seeing now is yet another worldwide coordinated campaign by the Greens to rescue the global warming theory from the junk heap to which it should be consigned. None of these problems has been solved. The Year the Global Warming Hoax Died. The hoax has mainly been a creation of the United Nations Environmental Program and took off in earnest with the 1992 Earth Summit. It culminated in 1997 with the Kyoto Climate Control Protocol, an agreement to reduce the generation of carbon dioxide, a "greenhouse" gas (CO2) said to be the cause of an accelerated warming of the earth. Few, if any, nations have ever met the limits that require reductions in CO2 production, attributed to the use of so-called "fossil fuels" such as oil, natural gas, and coal. Don't print propaganda on global warming. These distortions and half-truths are meant for only one purpose: to scare people into doing something irrational like spending trillions of dollars for very minimal gain, cripple the economy with carbon restrictions and greatly expand government. Global warming is a hoax, invented in 1988 that combines old myths including limits to growth, sustainability, the population growth time bomb, the depletion of resources, pollution, anti-Americanism and anti-corporate sentiment and, of all things, fear of an ice age. Those that espoused and supported the old myths have joined forced into a new group called "Environmentalists." Most environmentalists have no technical or scientific credentials whatsoever. What they have are major news outlets ready and willing to publicize their every utterance regardless of whether or not they are backed up by scientific proof. Global-warming myth. On May Day, Noah Keenlyside of Germany's Leipzig Institute of Marine Science, published a paper in Nature forecasting no additional global warming "over the next decade." Al Gore and his minions continue to chant that "the science is settled" on global warming, but the only thing settled is that there has not been any since 1998. Global Warming: The All-Purpose Farce to Control Your Life. The Democrats (a.k.a. global warming wimps) have found the rhetorical weapon they will use for at least the next decade to decrease your liberty while increasing their power, and that weapon is the hysteria over global warming. Environmental doomsaying is one of the most powerful tactics that liberals use to obtain and wield power. At its heart, the Democrat Party is a coalition of interest groups that feed at the trough of the government. The more power the politicians and bureaucrats have, the more contracts and benefits the groups can gobble up. the same government contemplating declaring the thriving polar bear population "endangered" for the sole purpose of putting areas off limits that are believed to be rich in new oil reserves, not unlike the prohibition on extracting oil from ANWR. Anatomy of a Hoax: Money may be the mother's milk of politics, but self-righteous hysteria is its drug of choice. That is worth remembering, as the UN releases the report of the International Panel on Climate Change (IPCC), and headlines begin to trumpet that global warming is "settled science" or "solid science" and that the role of human beings in creating global warming ("climate change," these days, note the change) cannot be denied. Latest Science Debunks Global Warming Hysteria. Carbon dioxide is increasing in the atmosphere at a rate below that of most climate-change scenarios because it is being increasingly captured by growing vegetation. The second most important human greenhouse enhancer — methane — is not likely to increase appreciably in the next 100 years. And perhaps most important, the direct warming effect of carbon dioxide was overestimated. Even global warming alarmists in the scientific establishment now say that the Kyoto Protocol will have no discernible impact on global climate. Lord Lawson claims climate change hysteria heralds a 'new age of unreason'. One huge gap in the IPCC's thinking, Lord Lawson suggests, is that "it fails almost completely to take account of the capacity of human beings to adapt to changing temperatures — as we can see from comparing Finland with Singapore, two of the world's most successful economies. In the first, people manage to live happily with an average annual temperature of 5°C; in the second, they can cope with an average of 27°C." Global Warming Lies Create a Climate of Crisis. There is no dramatic warming occurring. Predictions of this are based on totally flawed computer models, none of which can begin to approximate the sheer chaos and complexity of the Earth's weather system. These computer models, put forth by the United Nations Intergovernmental Panel on Climate Control, have been repeatedly revealed to be inaccurate to the point of deliberate deception. The constant assertion that there is a "consensus" among scientists that global warming is caused by humans is yet another part of the lie. Carbon Dioxide and the "Climate Crisis" — Reality or Illusion? James Hansen, Director of NASA's Goddard Institute for Space Studies, similarly claims that the earth "is close to dangerous climate change, to tipping points of the system with the potential for irreversible deleterious effects," and he contends that "ignoring the climate problem at this time, for even another decade, would serve to lock in future catastrophic climatic change." Do these dire contentions reflect reality? Or do they portray but a marvelously-crafted and hugely-effective illusion? Weather Channel Founder: Global Warming 'Greatest Scam in History'. John Coleman, founder of the Weather Channel, has written an article in which he calls the idea of man-made global warming 'a scam." The Year the Global Warming Hoax Died: When did the global warming hoax die? Historians are likely to pinpoint 2007. It will take another decade to ensure it cannot be revived, but the avalanche of scientific studies and the cumulative impact of scientists who have publicly joined those who debunked the lies on which it has been based will be noted as the tipping point. The Global Warming Hoax: Yes, the Earth's surface has warmed a bit over the past century, but is that warming caused mainly by humans or by natural cycles? And can changes in human activity — specifically reductions in carbon-dioxide emissions — have anything more than a tiny effect on temperature? The answers to those questions, which are at the heart of the Kyoto Protocol and other attempts to force cuts in energy use, are simply unknown. It is the claim of certainty that is a hoax. It's a dangerous one, too, since using global-warming theory as the basis for extreme policy mandates could plunge the world into a long-term recession or even a depression. wants to eliminate the mortgage tax deduction on what he calls "McMansions," homes that are 3,000 square feet and larger. That's because larger homes use more energy. The full agenda is to start out with 3,000 square feet and later lower it in increments. Our buying into global warming hysteria will allow politicians to do just about anything, upon which they can muster a majority vote, in the name of fighting climate change as a means to raise taxes. Debunking Gore's 'consensus' hoax. This new book by Lawrence Solomon who wrote a series of articles in Canada's NATIONAL POST about eminent "deniers" of Climate Alarmism has discovered there were so many such individuals he had to write a book to document them all. Global Warming and Other Urban Legends. [Scroll down] The other big lie that's caught on in a big way is global warming. I suspect this is strictly an urban legend because in rural America, farmers have the experience and the common sense to recognize the cyclical nature of climate. … What I find so fascinating about it is that Al Gore's disciples are able to explain all types of weather as a result of it. Let's put a freeze on global warming hype. Exactly 31 years ago tomorrow [4/28/2006] Newsweek carried a story that predicted a rapidly cooling world that would result in a "drastic decline in food production — with serious political implications for just about every nation on Earth." Hmmmm? It's the same doom and gloom scenario we hear today except turned on its ear —now, however, it's not about devastation caused by cooling but rather by global warming. Global warming debunked. Climate change will be considered a joke in five years time, meteorologist Augie Auer told the annual meeting of Mid Canterbury Federated Farmers in Ashburton this week. Man's contribution to the greenhouse gases was so small we couldn't change the climate if we tried, he maintained. "We're all going to survive this. It's all going to be a joke in five years," he said. A little warming, a lot of hysteria. The debate was supposed to be over by now, but it's not. … Al [Gore] and proponents of global warming argue that whatever bad happens, happens because of the greed of man, and mostly Americans at that. Icebergs floating too far south? Man did it. Torrential rains in Monument Valley? Blame it on global warming. A drought in Tacoma-Seattle? Fog in Phoenix? Man set fire to the globe. Keep it scary, and keep it coming. The end of the world — according to Gore. "Less than 10 years." That, Gore warns, is all the time that "leading scientists" say we may have "before we cross a point of no return" — unless we make a "really good start toward dramatic changes" to combat global warming. A Culture War of Words: If anybody doubts America is engaged in a culture war and losing it they need only to take a look at the series of concerts promoting Al Gore's global warming hoax last weekend. They would have learned that the war is being waged in the sewers. America is facing an army of foul-mouthed, tattooed guttersnipes who have the gall to proclaim they want to save the planet by putting on performances laced with some of the foulest language ever heard from a stage. "Global warming" hype reaches fever pitch. "The wealth of the United States is, and has always been, the target," says Tom DeWeese, president of the American Policy Center. "The new scheme to grab the loot is through environmental scare tactics." Most Preposterous Claim Ever: [Scroll down] There is no such study. The [National Academy of Sciences] did not conduct such a survey. This is either a complete fabrication or a massive confusion. Water Companies Present Flawed, Biased Study to Demand More Funds. The Association of Metropolitan Water Agencies (AMWA) has spent $60,000 in taxpayer funds on a biased, laughable study claiming global warming entitles water companies to more federal tax dollars. To provide cover for its attempt to hop on board the global warming gravy train, AMWA contracted with a consulting firm guaranteed to deliver AMWA's pre-determined outcome. Fiction fuels global warming. Since facts and science can't seem to debunk the faulty notion of global warming being caused by humans, perhaps fiction can. Virtually every month, new reports by the world's top climate scientists debunk the correlation between increasing CO2 emissions and the warming of the Earth. Climate Alarmists are Playing a Shell Game with Data. I have spent much of the past two years analyzing and reconstructing some of the basic studies used by the Intergovernmental Panel on Climate Change (IPCC) to support their conclusions about global warming and in turn to promote policies on climate change. My conclusion … is that the major science journals and organizations lag far behind the corporate world in ensuring the quality of researchers' data. Another False Alarm on Global Warming: Global warming alarmists are once again saying a "new study" has proven them to be right. But once again, the study they are citing is inconclusive. Alarmist Activists Claim Global Warming is Simultaneously Baking and Freezing Europe. Europe is simultaneously baking and freezing, and will continue to do so as a result of global warming, alarmists asserted in global media reports in November 2005. The two theories upon which the claims were made were promptly debunked by climate scientists. Don't be fooled; a green CIA won't root out the terrorists. In the 2008 intelligence authorization bill, just passed by the House of Representatives, the directorate of national intelligence or "DNI" (also known as the "intelligence czar") has a new job — to develop within the next nine months a top-level paper laying out the "anticipated geopolitical effects of climate change and the implications of such effects on the national security of the United States." Global Warming Heresy: Manmade carbon dioxide emissions are roughly 5 percent of the total; the rest are from natural sources such as volcanoes, dying vegetation and animals. Annually, volcanoes alone produce more carbon dioxide than all of mankind's activities. Oceans are responsible for most greenhouse gases. ... The bottom line is, the bulk of scientific evidence shows that what we've been told by environmentalists is pure bunk. The climate scare: The earth has warmed about one degree in the past 100 years. Climate changes. It always has. I reported on the real warming trend in my TV special, "Tampering With Nature." The real question is whether the warming is a "crisis," and whether trying to "fix" it will help or just wreck the lives of the poor. Global Warming Myths. I think most people, whether they know anything about the science involved, have decided that more than twenty years of lies about "global warming" have failed to demonstrate it is happening or likely to occur any time soon. ... Disdain and contempt for human life is the rampant theme of environmentalism. You are still more likely to be threatened by a raging hurricane or a blizzard than from SUV's, pesticides, or the use of coal, oil and natural gas to light, warm or cool your home or apartment. The Myth of Dangerous Human-Caused Climate Change: Human-caused global warming has become the environmental cause celebre of the early 21st century. The strong warming alarmist camp currently includes the United Nations, most Western governments, most of the free press, many large corporations (including Enron, before it failed), the major churches, most scientific organisations and a large portion of general public opinion. This phalanx of support notwithstanding there is no scientific consensus as to the danger of human-induced climate change. There is, therefore, a strong conflict between the level of public alarm and its scientific justification. How can this be? Junk Science: Nature and Maple Syrup. In the spring of 2004, the Boston Globe and Associated Press created a sensation by reporting that global and regional warming are affecting maple syrup production and will eventually spell disaster for maple syrup farmers. The Globe's report was based largely on anecdotal reporting of people's memories. New Science Quiets the Alarm Over Global Warming. We need to review the basic assumptions that have driven our climate-change policy over the last five to 10 years. Global-Warming Swindle: Hysterics exposed. There is no question that the globe is warming but it has warmed and cooled before, and is not as warm today as it was some centuries ago, before there were any automobiles and before there was as much burning of fossil fuels as today. None of the dire things predicted today happened then. Environmental hysterics: Maryland Gov. Martin O'Malley recently warned that failure to take action on global warming could mean the extinction of the human race. Over the last few years, we've been repeatedly warned we are in the midst of a climate crisis that threatens our survival. Al Gore calls it a "planetary emergency." We might take this concern more seriously if the doom-mongering wing of the environmental movement weren't burdened by a long history of false prophecies. So, please excuse my skepticism when you claim global warming means the end of the world is nigh. I have heard it all before. The "crisis of the month": Global warming. The list of supposedly pending disasters is a long one: Besides global warming, there is ozone depletion, acid rain, radiation, pesticides, toxic chemicals, hazardous waste, and many more. These possible hazards attract far more attention than does the progress being made in air and water quality. Yet in case after case, the warnings of impending disaster are exaggerated. Exaggerating the dangers of global warming: At some point during their recent years of impotence, a crack team of Democratic strategists retreated to a backroom to kick around possible issues. They pondered. What's as scary as 9/11 but scarier? What's just inaccessible enough to average Americans that they won't question it? What will cause people to say 'the scientific community' a lot? Let me throw in one fact before you crumple this paper up and place it in the nearest recycling bin: global warming exists. But it's not that big of a deal. Revisiting the Global Warming Hoax: Little known to the public is the fact that most of the scientists involved with the UN's Intergovernmental Panel on Climate Change do not agree that global warming is occurring. Instead, its findings have been consistently misrepresented and/or politicized with each succeeding report. Weather reports that the global-warming alarmists rather would neither have published nor read. The press corps covers global warming: I've believed for years and years that global warming is a hoax perpetrated on the political world by Malthusian Greenies whose hidden agenda is a smaller world population and falling standards of living. Yawn - It's Just Political Scientists. Politics distorts science, particularly environmental science, because 99.99 percent of those sciences' financial support comes from the federal government. Scientists distort science because their careers depend on the money they bring to their university or their laboratory. Both the employees of the academy, and the academy itself, must support a political process that results in the exaggeration of threats. In competition for a finite federal outlay, scientists present their particular issues (global warming, cancer, AIDS) in the most urgent light possible, threatening societal ruin if their work isn't funded. Hot and Cold Running Alarmism: Not so long ago "global cooling" was the preferred theory of environmental doomsayers. Ten Things Everyone Ought To Know About Global Warming: With all the hype about global warming and climate disasters filling the journals and air waves, here are some facts that need to be more widely known. Sunny Cali-fear-nia: According to Assemblywoman Fran Pavley (D-Woodland Hills), "Unless we act, California will experience heat waves, droughts, floods and forest fires that could devastate the economy of the state, including agriculture, fishing, timber, real estate, insurance, construction and tourism." Global Warming Models Labeled "Fairy Tale" By Team of Scientists: A team of international scientists Monday [5/13/2002] said climate models showing global warming are based on a "fairy tale" of computer projections. The scientists met on Capitol Hill to expose what they see as a dearth of scientific evidence about global warming. Coloring Climate Change : To get a sense of how compromised and politicized climate science has become, you don't have to look far. Just examine the lengths to which key documents were doctored to distort public perceptions. Watson Indulges in Scare Tactics ... Again. Predicting an 11°F temperature rise in 100 years, the IPCC's new Policymakers Summary is the product of the most extreme climate model run under the most extreme set of future emission scenarios. Global warming science uncertain: National Academy of Sciences finds warming, but no link to human activity. Global warming hot air: The global warming scare was played up by the media when the National Academy of Sciences issued a report on June 6 that said the earth's temperature is rising, mainly because of human actions, and that this could cause drastic climatic changes. The news stories and the editorials they inspired cited no empirical evidence that would support the claim that the earth's atmosphere is getting warmer and that this is likely to continue throughout this century. Myths and Meteorology: Like the Clinton administration before it, the Bush administration supports international efforts to curb global warming. Yet the evidence indicates that the earth is not overheating. Global Warming Is a Global Scare Tactic. Yes, the earth has and will go through periods of warming and cooling, but the overwhelming empirical scientific data indicates those cycles (and they are a process not an event) are a function of solar cycles … not greenhouse gases or your SUV. The global-warming hysterics strike again. The media can be depended on to ferret out and wildly overhype any potential negative development that any so-called scientist is willing to predict and deplore. Remember "acid rain"? … We had barely had time to digest this awful news when the same media introduced us to the ghastly phenomenon called the "ozone hole," … The subsequent news that the ozone hole was actually diminishing was lost in the gratifying burst of terror over the discovery of global warming. Careful Review of Science Refutes Global Warming Myths. With their new book, Unstoppable Global Warming Every 1500 Years, S. Fred Singer and Dennis T. Avery skewer all the misinformation that has been used for so long in an attempt to convince society that mankind is the root cause of all global climate change. The book is truly amazing! It meticulously supports, with hundreds of detailed, published references, the clear facts and conclusions that the Earth's climate has been traveling a well-defined rollercoaster path of temperature change for at least 900,000 years. Debunking global warming myths: Expert after expert in this film blasts craters into the theory that CO2 — which only makes up 0.054% of the earth's atmosphere — has ever driven climate. Ice core records, in fact, prove the opposite, that CO2 lags warming by as much as 800 years. The main cause of warming is, not surprisingly, the sun. Global warming labeled a 'scam'. With a packet of claims that are almost certain to defy conventional wisdom, a television documentary to be aired in Britain this week condemns man-made global warming as a myth that has become "the biggest scam of modern times." Media Promote Global Warming Fraud. On the matter of global intervention to stop global warming, there seems to be no need for scientific evidence to justify what is shaping up as a global carbon tax of 35 cents a gallon of gas on the American people. Our media want the public to believe that the same organization that gave us the oil-for-food scandal can be trusted on its dire predictions of calamity from alleged man-made global warming. The Global Warming Fraud: More Inconvenient Truths. [Al] Gore erroneously assumes that current conditions on earth are the natural state. Even a cursory study of the earth would reveal that nothing related to the earth is constant. Continents move, the oceans rise and fall, glaciers advance and retreat, the magnetic poles have moved and reversed, the composition of the atmosphere has varied and the earth's temperature has warmed and cooled. All of these events occurred without any human influence. Cap-and-trade fraud. The costs of reducing [greenhouse-gas emissions] through cap-andtrade regulations are not trivial. If implemented, cap-and-trade policies would add significant costs to production and would likely have a severe negative impact on long-term U.S. growth, an amount we estimate at $10,800 per family. Global Warming Hoax Continued. The new Democrat majority in Congress has decided to flex its muscle on global warming. Prior to this month [January 2007] the most Democrats could do was spout their spurious climate change charges and hope someone would listen. Now they can drive public policy. This is a real shame, because there are real world consequences in fighting a threat that doesn't exist. The Great Global Warming Swindle: Observations in ice cores show that temperature increases have preceded — not resulted from — increases in CO2, by hundreds of years, suggesting that the warming of the oceans is an important source of the rise in atmospheric CO2. As the dominant greenhouse gas, water vapor is far, far more important than CO2, yet not well handled by climate models — and, in any case, not within our control.